Maxthonology | Fun Browsing is a Science! Fun Browsing is a Science! Heads up! A new Maxthon 4 build, 4.0.3.5000 (RC), was recently released, it’s mostly a bug fixes release with no major changes. Sorry guys; no skin support yet! Who needs that anyway? *looks at angry mob* we all do of course. Love it or hate it, the windows 8 start screen is certainly something that will not go away soon. What makes using the start screen much more bearable is a small, neat application called OblyTile, this program makes it possible to add “tiles” (the bunch of colored squares you see on the start screen) to launch any application you would wish to add to this screen. 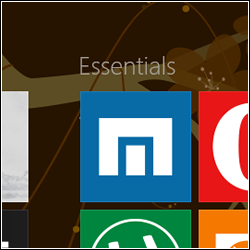 This is quite different from adding a shortcut to the startscreen from the “All apps” screen; by using oblytile you are able to choose an image that represents this application rather than being stuck with the incredibly ugly default way of showing non-Metro applications on the start screen. It all started with a small, relatively unknown browser named MyIE in 1999, that was then renamed to Maxthon (version 1) on 2003, from there, a journey of exciting features additions, dramatic features omissions and lots and lots of forum posts followed, until 14 years later, when the latest version of Maxthon – version 4- was released. Just 4 major releases? I wonder what would happen If chrome developers created Maxthon. Hmmm..
Nevermind, this isn’t interesting. You are not reading this for a history lesson full of material copied from wikipedia, are you? What’s really interesting is how the developers of Maxthon managed to survive all the widely-changing world of technology without being left in the dark corner of irrelevance. A feat achieved only by a few number of applications. Below this post are old posts that were created when this blog was active, long, long time ago. Above is where, hopefully, all-new, posts concerning Maxthon again will be posted. So keep an eye on this direction. What happened during that quiet month? new Maxthon 3 public release and a final 2.5.2 version, just in case you were absent during June too. Back to business now, see ya in my next post. Have you ever wanted, when you are at work, to open a link in your Maxthon favorites? installing Maxthon itself is not an option as in this pretty close environment, IE (Internet explorer) and only IE is used and you can’t have anything else more usable. So what would you do in this case? You can open the newly released favorites website with any browser, where you can log in using your Maxthon passport and view all the favorites you have uploaded on the server using Maxthon, you can’t edit the favorites as for now but it’s still pretty cool to have this service. Thanks Maxthon team! A lot has happened in the past few days in the world of Maxthon, one of the attention-worthy events was that Maxthon won the webware100 award for the second time in a row, which is really great for a browser that is not one of the popular “big players”. We all hope that the final release of Maxthon 3 would keep the awards coming. If you have installed the latest version of internet explorer already, you would have noticed that the compatibility of Maxthon 2 with IE8 is less than perfect, particularly when it comes to supporting IE8’s improvements like the faster speed and better websites designing standards compatibility. Also there are some IE8 problems and bugs that affects Maxthon. Maxthon 2 introduced a nifty feature called Magic Fill, this little tool can fill forms with pre-saved data either login information for websites or personal information in registration forms (from what you fill in the Setup Center). Unlike Opera’s Magic wand (and a lot like Roboform’s feature “fill and submit”) you can with Magic fill save time opening a website, clicking the fill button and clicking the submit button by using the sub-menu of the Magic fill button to access your favorite websites, this way it only needs one click to open the site, fill the data and then submitting it. Clicking the item itself opens the website and fill only while the little “play” button on the right of each item works as a “fill and submit” option.